I love getting my hands dirty (literally) but I’ve hit my limit when it comes to finding a good hand cleaner which is why I’ve tested the following 3 pumice soap hand cleaners to see which one performs the best. I wear gloves as often as I can to avoid dirty hands all-together but sometimes I do need that extra feel and invariably my and nails will show signs of dirt for days to come despite multiple washings. To test these hand cleaners I’m mucking up my hands with plain dirt then following up with oil. This should create a nice sticky mixture of oil and dirt that should challenge any type of soap. After washing my hands I want them to not only be clean but also not feel completely dried out. After washing my hands I should feel confident enough to use my keyboard or pickup my toddler without leaving fingerprints or fear of smudging them. My hands should not feel greasy from any soap residue or from any grease/oil that didn’t get cleaned off. Here are the 3 pumice hand cleaners I chose for this test that seem to be the most popular available at local home centers and hardware stores. All three of these hand cleaners feature pumice as a scrubbing agent and the two liquid soaps add orange that is mostly for a pleasant smell. According to the ingredients there is no real orange that would contribute to the cleaning effectiveness of these soaps. The orange container seems to have become ubiquitous for industrial strength hand cleaners that mechanics and contractors will simply look for it around sinks no matter what the brand. I’ve used a lava bar for years. Before this test it was the only type of pumice soap that I’ve used at home. It’s cheap and I always know that it will work. For this test it performed well. It takes some work to work it into a lather which you need to really get the full benefit of this soap. Just rubbing the bar on the back of your hand or between your fingers doesn’t work. You need to get the lather going before you start scrubbing. Once you’ve got the soap activated it works well and the scent is very pleasant. It has a masculine smell that is unmistakable and is more bathroom than work room which I prefer. The lava soap removed the oil from my hands and did not leave any residue. It did take a few more minutes to scrub with and I needed to pick up the bar more than once to use but it was still effective. The soap does contain a moisturizer but my hands felt slightly dry after using. Maybe because I needed to scrub a bit harder and leave the soap on my hands longer. Lava also comes in liquid form which I didn’t choose for this test but I’m sure it compares favorably. This soap came in a 14 oz squeeze bottle. It was easy to use but I’d prefer to use a pump which I can function with my elbow or non-dirty part of my arm instead of getting oil or grease all over the bottle. The GoJo soap has a slight orange smell to it but it’s not overwhelming. The soap is white and looks more like lotion although you can see tiny particles of pumice. GoJo cleaned my hands quickly and it felt smooth between my fingers and on the softer back of my hand. It not only looks like lotion but it felt like it and after rinsing it left my hands feeling soft. It works quickly and it didn’t take much to clean the oil so my hands didn’t dry out as much. The industrial look of this 48 oz. bottle with large white pump instantly puts it in the workshop room. The pump is big which makes it easy to use with your elbow or arm. It dispenses a good amount which should be enough for the dirtiest hands. This soap had the strongest orange smell which wasn’t unpleasant and didn’t linger on the hands but it was fragrant when first dispensed. The soap feels like it has more pumice in it than the GoJo and wasn’t lotion-like. It remove all traces of dirt and oil with no residue. 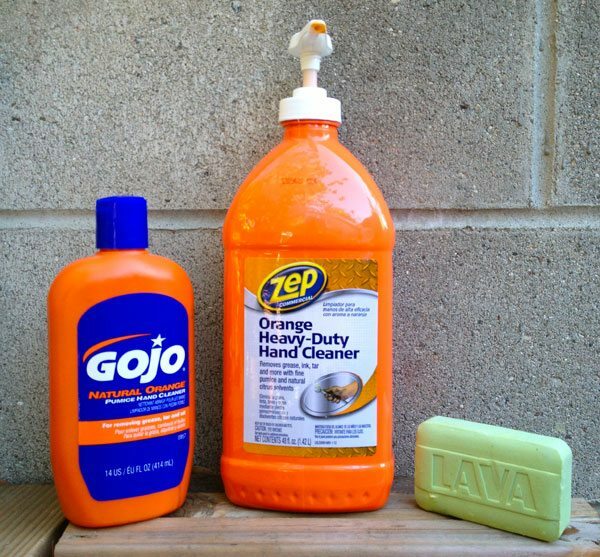 All three pumice hand cleaners did their job but if had to choose just one I’d go with the GoJo. It moisturized the most and worked quickly. There was a very slight greasy feel that some lotions have but there was no residue after cleaning. I’d prefer a pump on the GoJo bottle but the size is ideal for most home applications. The Zep orange cleaner would be my second choice but only a slight notch below. The large size of this bottle is a bit awkward but the pump makes up for it. Although strong the orange smell is really pleasant and makes me feel that my hands are extra clean (a mind game perhaps). The Lava bar comes in last but mostly because we prefer our pumice soap in liquid form. It took too much time to get the Lava to lather up and felt the roughest on our hands. We’d like to try the liquid Lava in our next test. All three of these soaps will work well but I suggest using gloves whenever possible. Buy a box of latex gloves and they’ll last you a long time. If you don’t like wearing gloves then please use these soaps to help prevent “stained” hands which you can get from oil and metal dust embedded in your skin. The only way to really gets removed is from skin replacing itself over time. You may suffer from dry hands after repeated washings throughout the day. Udder cream is a great solution and I also like the O’Keefe’s working hands cream. Have you used any of the above soaps? What is your experience with them? I left off the powdered hand cleaners as I simply think the liquid pumice is superior.